I want to hear the stories behind the nicks and dings on your guitar. Any good ones? I still remember my first ding on my Kenny Hill New world guitar. It was a beautiful finish until I stood up hastily in the practice room and let the edge of a stand skip along the top. I was playing at an outdoor wedding reception and as I set my guitar down I somehow missed the guitar stand and dropped the guitar on the concrete patio floor. It fell from a height of a few inches and I immediately caught it by the neck, but it got a good solid thwack against the floor. Remarkably, all that happened was that it roughed up the finish along the binding at the base of the guitar. Scared the hell out of me, though. I thought I’d completely killed the guitar for a moment. There are none on my Alhambra 6P at the moment, but I’ve had it for less than a week. I changed its strings (for the 1st time) last night, and was terrified I’d break or scar something. We both survived the ordeal. My Lacroix has a scar from when a repair shop scratched the finish while removing the bridge saddle, to lower the action, which I told them specifically not to do. Well, I have quite a few horror stories, but my worst ones are – the weeks leading up to getting my nice new finely french polished lattice braced concert instrument I’d been playing lots of gypsy kings style rumba noise gigs in a rude and undisciplined manner, and then about 3 days after I’d got the guitar, I forgot I had a RH thumb nail the size of a dagger, and on one piece requiring a particularly stiff downstroke of the thumb, I missed a bit and managed to scrape a 2″ long gash in the finish below the strings – DOH! But by far the worst (with this guitar) happened at a gig about 2 months later with the very same guitar. It suffered a whiplash from an XLR plug on the end of a mic cable that had been stamped free from it’s socket by some hefty turd who shouldn’t have been on the stage in the first place. The edge of the plug went clean through the top about half inch from the rim (7 o’clock around on the treble side). It was repaired using a cedar patch clued into place underneath with magnets, and thankfully the guitar is still loud as hell and getting more boomy, blustery and bloated by the day – rather like it’s owner…. Ok, The esteve guitar, wasn’t a particularly good example, but it was all I had for a while. I was playing as a troubadour and had just given up the steel strings and moved onto a classical nylon and playing the odd solo piece. Set one, I was perched on a small 6″ high stage in the corner, bar was quite empty – I was getting hassled by a drunk guy about playing the wrong type of guitar, or he wanted me to play this or that song or he wanted to tell me about his strat or whatever. He kept coming over to the stage to shout and slobber in my ear and every time he’d stumble on the edge of the little stage – the rest of the time he was swaying about the place crashing into stuff, tripping over and spilling beer. I remember seeing him sit down over in the other corner so I cut the 1st set, stood the guitar on it’s stand and went for a pee break. Imagine what I saw on my return!!!! The stool was overturned, the mic stand was on the floor and the poor guitar still on it’s stand was laid flat on it’s back with a nice big rip in the top on the bass side beside the bridge. There was also broken glass and spilt beer on the stage. The drunk guy was nowhere to be found and the air blue with my cussings. According to the barstaff he’d seen me go to the crapper, and gone to have a go on the guitar, but as he reached out to grab it he tripped over the bloody stage YET again, and fell flat onto the poor guitar and spilling his drink over all my other stuff. My current guitar when its not being played lives in it’s case at all times and is never no further than 3 feet away from someone trustworthy. I can’t count how may lessons learned. Sorry for the essay! A rectangle of a transparent thin plastic material (sorry I don’t know the word for that), that is as long as the bridge and like two inches wide, with two paper tapes (the paper tape is important because the glue is weak and doesn’t damage the finish) on the sides of the plastic. No worries about dings anymore. At the moment I have no horror stories. Lucky me. 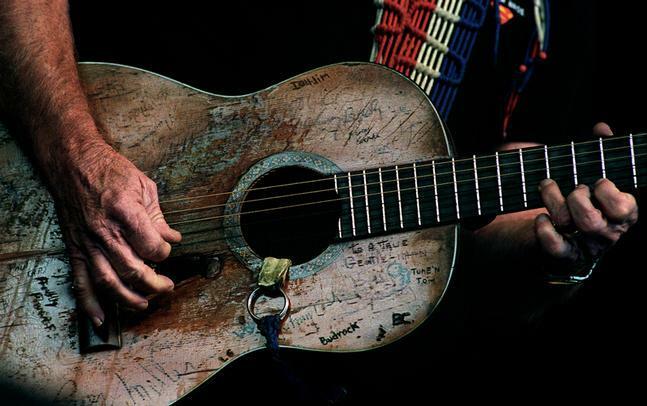 And if that’s not enough for you to stop crying when you make your first scratch, nick or ding, just think of trigger, Willie Nelson’s guitar that he refuses to part with (also a classical guitar). what a coincidence to read those stories this week. I freaked out when I hit my Hill on the corner of a table next to where I was playing! I called it a gouge! My husband kept saying, “I’m sure glad I didn’t do it!” Doug, my guitar teacher, assured me it was just a ding and added charactrer. It seems to me the only character it adds is to say I was clumsy! I’m getting used to it-but I still don’t like it and I still think it is a gouge! I don’t have any real horror stories about my Classical guitar years but i remember the first good ding in my Les Paul. I had it on a stand next to my half stack. On top of the amp was my wireless receiver. I somehow knocked the receiver of the amp and it banged into the front of the guitar leaving a ding in the cutaway,next to the volume knob and one on the lower bout. Three for one. Damn that sucked. After giving my new Ramirez its first ding on my metal music stand and having countless near-misses, I invested in a wooden stand and footstool. Mine cost over £40 but it was well worth it, especially in the confined practice space I used. The stand is as portable as a metal one and very light to carry around. Sadly, I wasn’t later able to protect it from injury by a metal radiator and a pair of flying scissors…..! I have several, but will limit to only 3. I ate beans and rice for over a year to afford a martin D-28 in 1985. I played her constantly and even fell asleep doing so several times. One morning, as I got ready for work, I tossed a wooden hanger onto the bed – forgot the D-28 was there. Result: dent in face of lower bout. Just last year I put that guitar in case too close to a heater vent in the winter. Result: finish cracks on back lower bout. Last December I bought a new Kenny Hill Hauser ’37. While polishing her the afternoon she arrived, my fingernails (used for playing – ironic as can be) pressed on the doubled over cotton cloth I was using and I put two dent furrows just head of the bridge (opposite of yours). Those tops and French polish, are sure delicate. Finally, when we were 14 (mid 60s) my friend and I started a R&R band and he asked his father, who lived in California, for a guitar. He sent an old Gibson L-5 in perfect condition. Of course, not appreciating such a guitar, we took it apart, painted it with blue brush-on paint, did a terrible job of putting in electronics, and converted it to a bass guitar. It came apart and ended up in the city dump. Result: I’m still haunted by Lloyd Loar. I’m not sure but I believe Chris’ problem was not in restringing his guitar. Rather, a string came loose later and left the gouge while unravelling. The card is a great idea wen changing strings and I make it a habit of using one myself, but we can’t very well leave it on all the time. I appreciate all of these lessons; I don’t know about you but I hope I learned something from each of them like tying your strings on correctly, watching out for drunks and others where you play, making sure you are setting the guitar down carefully, etc. Thanks, Chris! Yep, you’re right Michael. My string came off in the case, about 20 minutes after I had changed strings. I was noodling on my No. 1 guitar (first guitar I ever built), which I don’t play often, before going to a friends house to show off some compositions. Old No. 1 was sounding pretty good! I got a phone call and quickly put the guitar in the case. After the call I was late, so I grabbed the guitar case and headed for the door. Kerplunk! I had not latched the case and the guitar flopped out onto the edge of the lid, and now there were three gouges near the sound hole by the big E string. I had learned this lesson decades earlier, but was lucky that time – no damage. Now the lesson is permanently “gouged” into my psyche! This happened when I was in High School, I was out camping with a bunch of people. My guitar was in the camper and I was in the tent, then I heard a crunch. Someone had come down from a top bunk and stepped into my guitar. OUch it was now well cured firewood. It was a cheap guitar but none the less I was still heart broken. i also had a sting unravel while restringing my guitar made by david, which i bought 8 year ago. The Luthier mentioned a couple years ago that apart from the ding it looks exactly the way it was when i bought it! I always the a knot at the bridge now when stringing the e, b and g.
i have a gibson and ive gotten to the point where i dont care if i dent or ding it… and my guitar spends all its time not on stage or at practise in my gargae, and its started to rust the screws in the guitar…. i dont mind, because i know im playing gigs with the guitar and that makes me happy, happier moreso in relation to the sadness the rust and dents make me. Does anyone have any good sight reading stories? I am writing a paper and I need a few more examples. Right now all I have is one about John Williams. Does luthier Robert Garcia have a business in San Jose, California. Where did you purchase your Garcia? Do you know where Garcia is located and is he still building. I’m interested in purchasing a Garcia classical guitar.